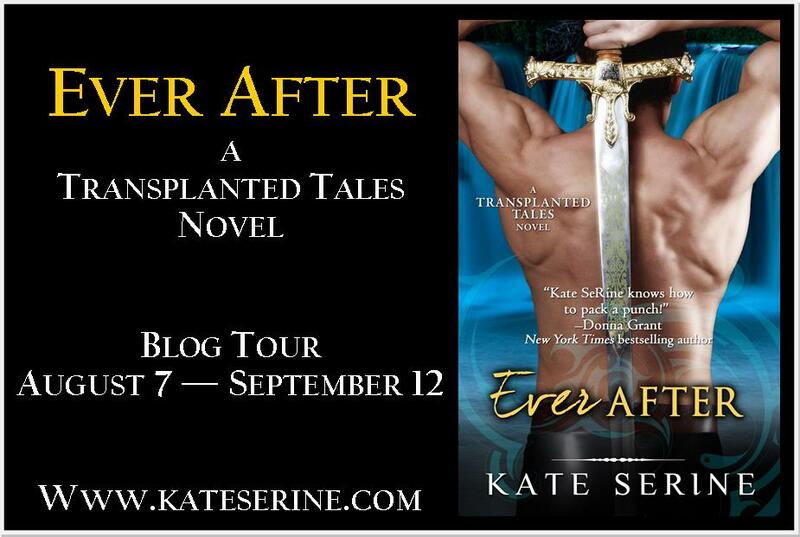 Welcome to Kate Serine the author of the Transplanted Tales series. Her last book Ever After is out this month. Thanks to her for this post. 1) Beauty and the Beast – I’ve loved this story since I was a little girl. I remember seeing a made-for-TV movie of it when I was about seven or eight years old and being completely captivated by the love story. And I think part of the reason this story continues to remain in my Top Five is because its message of selfless love, sacrifice, self-discovery, and personal growth is timeless. 2) Snow-White and Rose-Red – In this story, a prince who has been turned into a bear by a wicked dwarf is rescued by the kindness and love of two sisters. I’m not sure what it is about this story that sets it above so many others, but I just know this was the book I always chose when it was time to curl up in my mom’s lap for story time and that it still has a special place in my heart. 3) The Three Bears – This story was probably one of the first fairytales I ever reimagined. I know this because somewhere in the family archives there’s a recording of me at age three telling an action-packed version of The Three Bears to my aunt and uncle. There was scandal, intrigue, and all kinds of zaniness. This will always be one of my favorites. 4) Rumpelstiltskin – I think my love for this story is more about my childhood memories than the story itself. My mother is a wonderful storyteller and used to entertain us at bedtime by acting out the stories, complete with silly voices for each character and a lot of slapstick comedy. Of all her bedtime stories, this one was the most fun to hear her tell. I had great fun reimagining the character of Rumpelstiltskin in Along Came a Spider. 5) Little Red Riding Hood – I’ve always wanted a red hooded cloak. I know, I know. They’re not exactly practical. But what can I say? They’re romantic. 😉 Little Red’s fashion choices aside, I’ve always loved the element of suspense in this story. No matter how many times I heard it as a little girl I was always on the edge of my seat. Considering how much I love this fairytale, it seems fitting that Little Red Riding Hood wound up as the protagonist in the first book of my Transplanted Tales series. J’avais initialement prévu de parler de mon conte de fées préféré. Mais ensuite, j’ai réalisé que je ne pouvais pas en choisir un seul! (Peut-être que c’est pourquoi j’ai un si grand groupe de personnages dans chacun de mes romans …). 1) La Belle et la Bête – J’aime cette histoire depuis que je suis petite fille. Je me souviens avoir vu un film télévisé quand j’avais environ sept ou huit ans et j’ai été complètement captivée par l’histoire d’amour. Et je pense qu’une partie de la raison pour laquelle cette histoire continue à rester dans mon Top Five est parce que son message est basé sur l’amour désintéressé, le sacrifice, la découverte de soi et la croissance personnelle qui sont intemporels. 2) Blanche-Neige et Rose-Rouge – Dans cette histoire, un prince qui a été transformé en ours par un nain méchant est sauvé par la bonté et l’amour de deux sœurs. Je ne sais pas ce qui met histoire au-dessus de beaucoup d’autres, mais je sais juste que c’est le livre que je choisissais toujours quand il était temps de se lover sur les genoux de ma mère pour l’heure du conte et il a encore une place spéciale dans mon cœur. 3) Les trois ours – Cette histoire a probablement été l’un des premiers contes de fées que j’ai jamais repensé. Je le sais parce que, quelque part dans les archives de la famille, il ya un enregistrement de moi à trois ans en train de raconter une version pleine d’action des Trois Ours à ma tante et mon oncle. Il y avait du scandale, de l’intrigue, et toutes sortes de loufoquerie. Ce sera toujours un de mes favoris. 4) Rumpelstiltskin – je pense que mon amour pour cette histoire est plus en rapport avec mes souvenirs d’enfance que l’histoire elle-même. Ma mère est une conteuse de merveille et l’utilisait pour nous divertir au coucher, en agissant sur ​​les histoires, les complétant avec des voix stupides pour chaque personnage et beaucoup de comédie burlesque. De toutes ses histoires au coucher, celle-ci était la plus amusante à écouter. J’ai pris beaucoup de plaisir à réinventer le personnage de Rumpelstiltskin dans Along Came a Spider. 5) Le Petit Chaperon Rouge – J’ai toujours voulu un manteau à capuchon rouge. Je sais, je sais. Ils ne sont pas exactement pratique. Mais que puis-je dire? Ils sont romantiques. 😉 Les choix de mode de Little Red mis à part, j’ai toujours aimé l’élément de suspens dans cette histoire. Peu importe combien de fois je l’ai entendu petite fille, j’étais toujours attentive. Considérant à quel point j’aime ce conte de fées, il semble normal que le Petit Chaperon Rouge se retrouve en tant que protagoniste dans le premier livre de ma série de contes transplanté. Author Bio: Kate SeRine (pronounced “serene”) is a hopeless romantic who firmly believes in true love that lasts forever. So it’s no surprise that when she began writing her own stories, Kate vowed her characters would always have a happily ever after. She’s the author of the award-winning TRANSPLANTED TALES series and will be releasing the TEMPLAR LEGACY series with Kensington and the PROTECT AND SERVE series with Sourcebooks in 2015/2016. We’re very happy to welcome today Kate Serine, the wonderful author of the Transplanted Tales series. 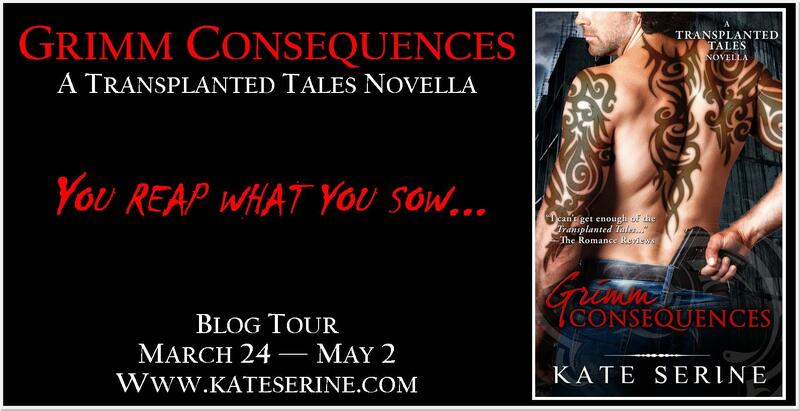 Grimm Consequences is her last release, a novella placed after the first book and featuring Nate and Red. Thanks to the author for her questions and we hope you’ll like it as much as we did. Thanks for having me by for a visit! In addition to being the author of the Transplanted Tales series, I’m a wife, mom, and coffee addict. I love anything and everything that has to do with science, science fiction, mysteries/true crime, history, and the paranormal. You’ll also find me geeking out over pretty much any movie adaptation of a Marvel comic book. How would you describe the Transplanted Tales series? The series is a little bit urban fantasy, a little bit paranormal romance, so I hope the books will appeal to both audiences. 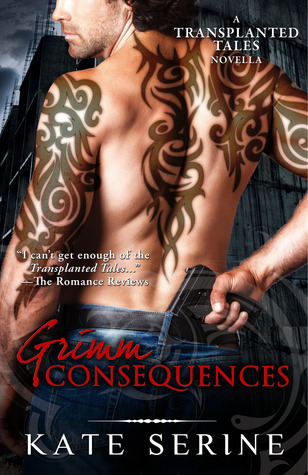 My current release, Grimm Consequences, is the novella sequel to Red and continues the story of Tess “Red” Little and Nate Grimm. How did you come up with the idea to write a story with characters from tales? The idea for the Transplanted Tales came to me during a conversation with my eldest son, who was 8 or 9 years old at the time. We like to have what we call “What if” conversations where he’ll ask me a question that’s totally out there and then we chat about it. That day he asked the question: “What if fairytale characters were living next door to us?” As we chatted about who it would be, what that Tale would do for a living, and so on, I started to get a very clear picture in my head of a tough, hard-hitting version of Little Red Riding Hood — all grown up and ready to knock some heads. And everything just fell into place. I wrote Red in record time for me—about four months. Was it difficult to create them a new life? Some characters were definitely more difficult than others! But it was great fun trying to put a new twist on the old tales and come up with something that would surprise and entertain my readers. If I couldn’t immediately come up with a fun “new life” for them, I would do a little research on that character to see if I could find something in the history of the story/rhyme/folklore that would inspire me. Right now, I just have one more full length novel scheduled. Ever After will release in August 2014. I’d certainly consider writing additional books in the series under the right circumstances and have planned out stories for other characters, but we’ll just have to wait and see what happens. That’s a tough question! I love all my characters—even the villains. I spend a good six months or more on each novel and get to know them pretty well. 😉 But if I had to choose one character, it would probably be Tess “Red” Little. Her voice was the loudest and most insistent from the beginning, and I had such an amazing time writing that first novel that Tess will always have a special place in my heart. There have been so many! Getting “the call”, signing with my agent, seeing my cover of Red for the first time, getting my first message from a fan, winning the National Readers Choice Award… It’s all been incredible! There are days I still find it hard to believe that I’ve been so blessed to be able to share my stories with others. That’s honestly the best part and brings me the most joy. No, I still work full-time and only get to write in the evenings and on the weekends. But, yes, I’d love to be able to write full-time one day! That has been a life-long dream. And I love Shakespeare, Oscar Wilde, Edgar Allan Poe… And those are just the classics! In paranormal romance, my all-time favorite is probably Lara Adrian. Love her Midnight Breed series! But I could go on and on about other amazing authors whose work I adore. I’m slowly making my way through the books of my fellow Seymour Agency authors and every one of them is incredibly talented. I have a couple of other projects in development. One is paranormal romance, another is romantic suspense, but the wheels of publishing can turn very slowly and there are no guarantees. I’m also really interested in writing horror and sci-fi eventually and have several ideas for stories in those genres, so we’ll see what happens! Thanks so much for letting me come by for a chat! 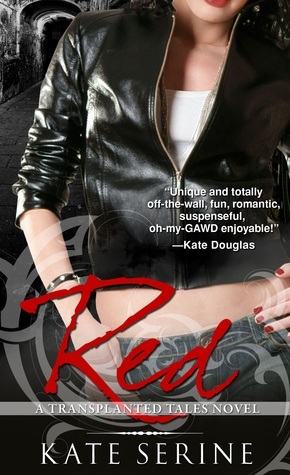 Review: Nobody knows how to rewrite tales like Kate Serine and it is true that I fell in love with Red. So you can understand my joy when I learned that the author was going to release a novella, featuring my fave characters Red and Nate! I was really looking forward to discover the story and to learn more about the two heroes. Moreover, although the volume is released this month, the story starts at the end of the first one and we can see what the two characters have endured to get to stay together. We thus find our little couple, but this time from the Nate’s perspective. It was really interesting to find both of them, especially knowing that this is my favorite couple of the series. But it is true that at the end of the first volume, we can’t imagine the consequences of what Nate did, and I must say that there are a lot of them. It is also in this context that a judge appears, to punish our dear Reaper… However, the punishment could be worse than expected and Nate isn’t the only one at stake now but also those close to him. This judge is twisted and has a crazy mind. He is ready to do anything to make pay our hero and he knows about his weak point. I enjoyed this story because in addition to see my two favorite characters, we also have the chance to learn more about the Nate’s past and I confess that I did not expect that at all. Everything was really good and it was a great surprise to find out as much about him. A new tale character is staged, and I’ll let you discover him, and of course, there are all the characters that we have come to appreciate for our greatest pleasure. A new very good novel that I can only warn you to read, Kate Serine always manages to take us into her world populated by characters we love.